The guys at The Drowned Earth just announced something very exciting! A “Choose your own Adventurer” event, which will run for the course of the campaign. And of course how the character responds to what happens in the story! So a choose your own adventure story, but choosing the nature of the character too! Best part of it? 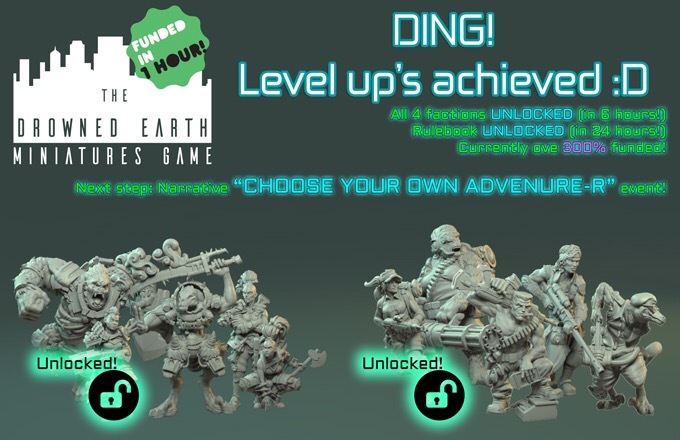 At the end of the campaign the model will actually be sculpted, and all backers at Starter Box level or higher will get it for free! So this is your chance to have your say on an in game character without having to pay 100’s of pounds for the pleasure. If you want to see some of the miniatures now check out Tales of an Under Average Painter to see my progress on painting up a few off the models.